MobiAD » Mobile Advertising News » Monetizing iPhone Applications With Advertising! Monetizing iPhone Applications With Advertising! 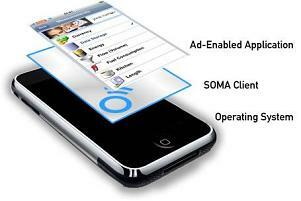 Smaato has announced the launch of iSOMA, an in-application mobile advertising platform for iPhone SDK developers. It will enable developers to monetize mobile applications for the iPhone through mobile advertising. SOMA (Smaato Open Mobile Advertising) platform is a quick and easy way for mobile developers to ad-enable their applications – whether online (live request) or offline (cached ads). The SOMA API is provided free of charge to the mobile developer community from the Smaato website. At the same time, Smaato has announced a new strategic alliance with mobile software companies. The companies included are Funambol, Go Life Mobile, MobiComp, Mocondi, MotionApps, Mobifusion, Quickoffice, Spotigo, and Spodtronic. Smaato will help them ad-enable their solutions.